Surprisingly, the base price for Assisted Living can run anywhere from $1,800-$8,000 per month. The base rate does not include any care provided by the staff - such as bathing, dressing, medication, management, or assistance transferring a loved one from the bed to a wheel chair. The cost of these services could run from $400-$3,000 per month. 1. When choosing a community, pick one that will allow care until the end of your loved ones life. Having to move the senior more than once can be very detrimental to their stress level. 2. Contact the Department of Military and Veterans Affairs to find out if the senior might qualify for Aide and Attendance Program. If eligible, the veteran or their spouse could earn a monthly stipend to pay for care. 3. Touch base with your CPA to check on tax deductions for your loved ones medical expenses. 4. When signing a contract with the assisted living facility, try to negotiate on the "Move-In Fee" or "Community Fee." This fee is a one-time amount that might range from $500-$10,000. Ask to have it waived or spread out over a few months. 5. Ask if the community is running any rate specials. Some will reduce the base rate or community fee if you take financial possession by the end of that current month. 6. If incontinence supplies are needed, buy them on your own through Costco or an online vendor. 7. If finances are limited, plan for the Medicaid Program. Not all communities are licensed for the program, so when the senior runs out of money, the assisted living or memory care community will ask them to move. Ask before you visit any community if they participate in this government program. 8. Consider opting for a shared room instead of studio or one-bedroom apartment. The price is considerably lower. 9. Does your loved one really care about the view? Some room costs are higher depending on the view. The family is usually the party that cares about the view of the mountains, not the senior. 10. Compare the prices of larger facilities to the small group homes. A residential ranch-style assisted living may fit into your budget if your parent feels more comfortable living in a more home-like atmosphere. 11. Is there a chance that if you order the medication required by the physician through your insurance or the Veterans Administration they might be less expensive? The medication management service offered as a level of care may order through a more expensive pharmacy. 12. If Long Term Care Insurance was purchased, read the policy and contact the company for any clarification needed. The incisal-qualifying period, daily rate allowed, and the maximum amount available, varies with each policy. The cost of senior health care may be alarming. Most Americans state, "I want to live in this house until I die!" That might be possible if a health crisis never occurs. The family must be prepared to take over the needs of a senior. Gather the family to discuss who would be available for items such as preparing the meals, offering help for personal care needs, renovating the house, transportation to appointments, or cleaning the house. 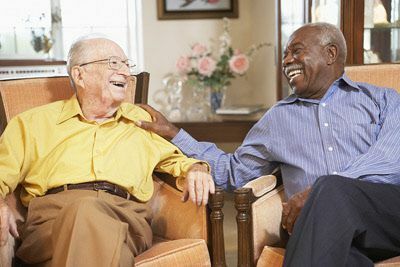 If the senior moves into a care facility, the roles change from being a caregiver to being a wife, son, daughter, or friend. Monitor your stress level so you do not become ill. Incorporate relaxation and exercise techniques into your daily life.